Graduate-Level Research in Industrial Projects for Students (GRIPS) in Japan will offer graduate students in mathematics and related disciplines the opportunity to work on industry-sponsored research problems in Sendai, Japan. Students from the U.S. and Japan will work on cross-cultural teams on research problems designed by industrial sponsors. The projects will be of serious interest to the sponsor and will offer a stimulating challenge to students; most will involve both analytic and computational work. At the end of the program, the teams will present the results of their work and prepare a final report. IPAM will encourage the U.S. students to publish and/or present their research at conferences in the year following the program. English is the only language required for participation. 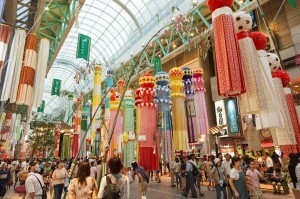 Round-trip travel to Sendai and accommodations in Sendai are included. Students will also receive a meal allowance and a stipend, and conference support to present their research. (These terms apply to U.S. participants recruited by IPAM. Japanese students may go to this site for information and an application. This program is partially supported by an IRES grant from NSF’s Office of International Science and Engineering.